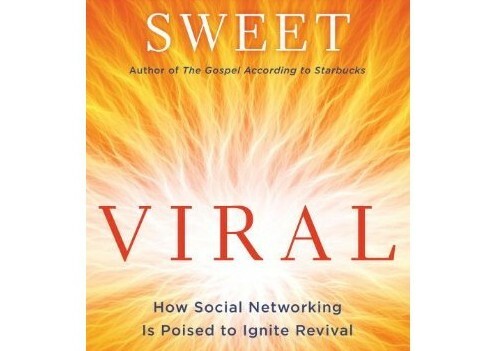 In Viral: How Social Networking is Poised to Ignite Revival prolific writer and provocative thinker Leonard Sweet delivers more of what we have come to expect from him. You will find him to be reasonable and passionate, calculated and surprising, humble and audacious. Sweet is a know-it-all in the best possible sense of the word, and the variety of fields and disciplines from which he pulls reflects the breadth of his learning. In Viral you will find yourself at one moment trying to hold on as you are pulled along by sweeping generalizations that sum up entire chunks of human history, and in the next moment trying to slow yourself down in order to understand the careful observation of some seemingly tiny and random object. If you are unfamiliar with Sweet you might encounter some early disorientation as your mind calibrates itself to his syncopated style. But don’t worry, Sweet is a taste that is easily acquired. Viral is an assessment of how the Church is situated in contemporary Western culture, and what that situation presents us with in terms of both challenges and opportunities. Depending on your opinion of that situation you may experience the assessment as an indictment on the culture, the church, or both. To be sure, the plethora of subjects and ideas covered in Viral will leave no one unchallenged. But to read the book as an indictment is to miss the point. One of the saddest things you can say about anyone? They stood in the presence of greatness and missed it. Let’s not miss our moment (p. 49). Yet, this is more than a naively optimistic we can do it mantra. In Viral Sweet is keenly aware of the dangers and pitfalls that may very well cause us to miss our moment. And so he proceeds to give us his best attempt at a roadmap. Along the way he offers a playful variety of analogies, quotes, poems and metaphors to light the path, as well as some of the compelling and proleptic anticipations that have given him the well-earned title of America’s leading Christian futurist. One gets the feeling in Viral that we are stopped at a T-intersection. Going back is not an option. So, we must turn one direction or the other. One of the turns is an attempt to run away from what lies ahead. The other turn is an attempt to run toward it. Sweet is hopeful, and so he chooses the turn that runs toward what lies ahead in the hope that Christ not only stands above culture, but also works through it in order to redeem and transform it. But the fact remains that if we are to move into the future, we need not to practice cultural apartheid, but cultural amphibianship (p. 192). So, Sweet forges ahead with the identification of two main cultural families, and playfully chooses 1973 (the year that the mobile phone was invented) as his dividing line (p. 14). Those born before 1973 he refers to as Gutenbergers, and those born after 1973 he refers to as Googlers. Sweet refers to Googler culture as TGIF, because it is built upon the following tools of relationships and life: Twitter, Google, iPhones and Facebook. Sweet fans will immediately recall the EPIC paradigm from Post-Modern Pilgrims: First Century Passion for the 21st Century Church, a connection Sweet himself finally acknowledges in the book’s appendix (p. 197). Sweet makes the interesting suggestion that EPIC represents the best interface for TGIF culture. I would have personally enjoyed an elaboration on the connection between the two. With the vehicle assembled Sweet spends the core of the book taking us through each of the four tools of TGIF culture. In each of the four areas he suggests both the promises and pitfalls that potentially lie ahead for us. He shows how each of these tools are more than tools, they are reflections of the essence and values of Googler culture. He affirms and warns both Googlers and Gutenbergers on how each of their tendencies might cause them to respond in both helpful and hurtful ways. And of course he weaves into each discussion the varying connecting points between the TGIF values reflected in Googler culture and the Kingdom values reflected in Jesus Christ and His Gospel. Each new generation needs to start fresh, but not from scratch. This is one reason Googlers need Gutenbergers, and vice versa. When we separate ourselves from the inherited memories of our ancestors, when the texts and traditions of the past do not join the present, the future is in jeopardy. There is no future without the past (p. 34). Looked at objectively, children need adults to help them assess, understand, and process information. The reversal is that, now, adults need their children to help them access information. In immigrant communities, the children teach their parents the new culture, the language, and the ideas. Today, adults need to listen to their children, because they are the natives and adults are the cultural immigrants (p. 52). Every generation has great expectations of the succeeding generations: our failures finally redeemed; our mistakes not to be repeated; our disappointments reversed. These are but a few of the expectations we project on the shoulders of our youth. But before we throw all these great expectations on them, we need to look over our own shoulders to our ancestors, stop giving our predecessors the cold shoulder, and let them lift us up on their shoulders. Life ought to be a robust collaboration between the living and the dead. If we are not careful, TGIF Culture will lose the knack for dealing with the past (p. 85). My burden in this book is for Gutenbergers to release the reins of power so that Googlers will not be forced to find God outside the orange world of partitioned faith. It is time to unite the two so long divided–for orange to be wed with apple. Until and unless that happens, I hold out little hope for vital, organic, growing Christianity in the Western church (p. 153). Every generation, every time, every epoch needs its Elijah, its Malachi, its John the Baptist. I believe this book is at least one small part in the collective, prophetic voice crying in the wilderness, seeking to prepare the way for the Lord for this time. That is why I highly recommend the book. But if you read it and only hear a conversation about gadgets and generations and generalizations and somehow miss this central nerve, this sweet spot in the story, then you will have missed the whole point. Sweet gives a convincing apology for why Googler culture might ignite revival in the Western church. But more than telling us why it might happen, he shows us a heart yearning for it to happen. More times than not when you are reading the last several pages of a book the author has already spilled all of the beans and is simply trying to find a serviceable way to end the conversation while we painfully try to endure the pointless rhetoric out of sheer sense of duty. Sweet actually saves his right hook for the last few pages. I will not give anything away, so no spoiler alerts are needed. I found his summation to be sublime. But I will say this, for Sweet, all things point back to Jesus. And that is the way that it ought to be. You will not be disappointed with the taste he leaves in your mouth. On second thought. Reverse that. This makes me want to enjoy more Sweet reads and more Stone reviews. Ha! I like it, Jen. And thanks for reading. Thanks, this sounds like a book I would love to read.